All our products made in U.S.A. Lesson Number(3) is at lower right corner. 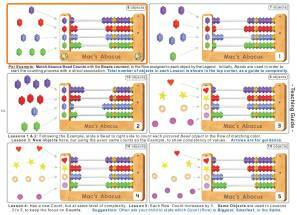 All 300 Lessons and 60 Examples are shown with detailed Answers to each in this section. Two lines of comments below each Lesson provide details of the concept being taught there. Great for Homeschoolers, Parents and Teachers. 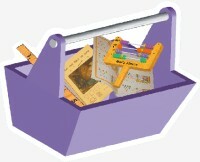 Lesson Examples have an orange border. Lessons have a gray border. 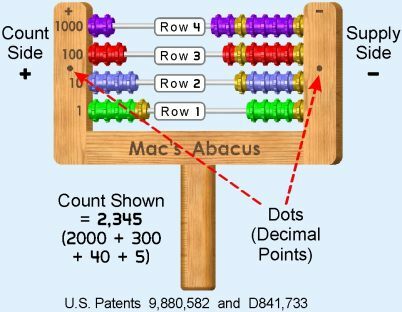 Lesson Numbers are on the lower right corner of Mac's Abacus. Beads in each Row are often grouped to indicate the quantities being added or subtracted. 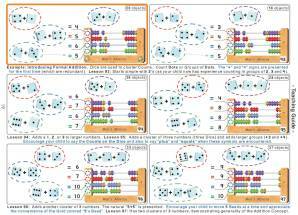 For example: If 2 is being added to 5 (Enlarge second image to see Lesson 94, second row from the top). That Row will have 5 Beads at the left, a small gap, then 2 Beads together. Their combination = 7, and your child is to print this on the line to the left of that Row.